At north of Mato Grosso State in the southern reaches of the Brazilian Amazon, lies the region of Alta Floresta,a host of incredible biodiversity. The birding areas around the town of Alta Floresta alone have a combined bird list of more than 600 species (fully one third of the entire Brazilian bird list!) 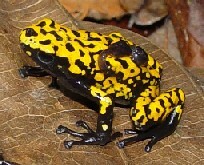 including dozens of endemics, near endemics, and range restricted species not easily found elsewhere. 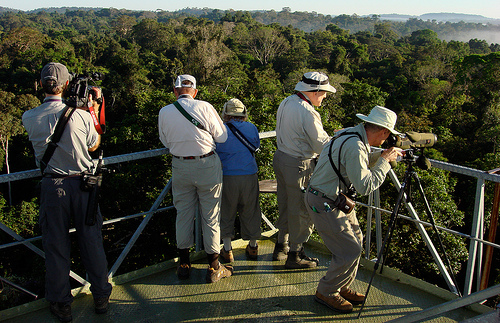 The Cristalino Reserve is one of the highlights birding spots of Brazil and South America. The geographic location in the headwaters of the Tapajós river contributes greatly to its ornithological importance because the river separates different populations of many forest birds. There are few places, even in the deepest recesses of Amazonia, where one can experience such undisturbed wilderness. The Rio Cristalino Lodge is situated near the geographical centre of Brazil, at the southern edge of the Amazonian rainforest, between two large rivers (the Rios Tapajós and Xingu) which have, over time, acted as barriers to the dispersal of many bird species. The 630 hectare privately owned forest reserve surrounding the Rio Cristalino Lodge is well protected and is bordered on three sides by 250,000 hectares of almost completely undisturbed jungle. No indigenous people live here, there is no disturbance from outside settlers and no hunting takes place. The lodge itself is built in a clearing on the banks of the river and offers excellent food, spacious rooms and even a sundeck. The Rio Cristalino is a blackwater river, a natural phenomenon whereby tannins leaching out from the forest vegetation through the sandy soil give the dark colour to the water. A major and much appreciated advantage of blackwater rivers is the relative lack of biting insects. We will have five full days to immerse ourselves in the amazingly varied avifauna of this splendid and little-explored corner of Amazonia. One of the main attractions here are the two well-built 50m high aluminum towers that offer extraordinary views over the surrounding forest, which stretches away to the far horizon. These towers stand next to one of the magnificent forest giants and the roomy platforms allow intimate looks at different levels in the surrounding forest canopy and its swirling flocks of multi-hued parrots, tanagers and toucans. We became the local authority in this region, due to several tours we run there, no other tour operator goes there as we do, and our guides are the ones who every body ask or report in case a new bird is found around. Indeed, there are half a dozen species only our guides saw there. We know nearly all territories for local specialties and have vocalizations for them! And we do not mean commercial recordings, but we taped the birds there! In 2015, we decided to do a birding immersion on the Southern Amazon, spending no less than 12 days within this incredible rich region. Two different lodges with diverse habitats and over 600 species of birds waiting for us. Our longer Southern Amazonia trips allow more time to really get to know the birds, to learn their habits, and to come to grips with rarer, low density species that other tour companies can only cross their fingers and hope for. We can run this trip at any time of year, in accordance with your preferred dates. An area of riverine forest west of town offers an excellent introduction to the birds of the Southern Amazon. We'll ease into the antbird extravaganza with chances for Glossy and Chestnut-backed Antshrikes, Amazonian Antwren, and Band-tailed Antbird. Near the river edges we'll look for Greater Schiffornis and Cinnamon Attila. Keeping a close eye on the canopy could produce a Spangled or Pompadour Cotinga sighting, along with perhaps Red-necked Aracari or Bare-necked Fruitcrow. Amazonian Antpitta is common at this site, and if we're fortunate to hear one fairly close to the road we'll give it our best shot. We have three full days at the Pousada Rio Azul, an exciting new destination in the southern Brazilian Amazon. Originally opened as a fishing lodge, the pousada has been receiving birders since 2007, when Birding Mato Grosso first discovered the locale as an important site for a number of rare specialty species. The foremost of these species is the recently-discovered (2002) endemic, the Bald Parrot. This compelling species is as grotesquely beautiful as its name suggests. We’ll be patrolling the river and other favourite haunts of the parrot in our quest to see for ourselves its featherless orange head, but in the process won’t be able to ignore a bevy of Amazonian beauties like Sunbittern, Crimson Topaz, and Red-throated Piping-guan. We’ll bird trails in the riverine forests in search of Flame-crowned Manakin, Snethlage’s Gnateater, Guianan Gnatcatcher and Fulvous-crested Tanager. Antbirds abound here, and Yellow-browed, Spix’s Warbling, Black-faced and Dot-backed Antbirds should all be expected. Birding around the lodge itself is often quite fruitful – the natural hummingbird garden created by planting native flowering bushes is active yar round: the usual suspects include Green-tailed Goldenthroat, Fork-tailed Woodnymph, Black-eared Fairy, and Tapajos Hermit, while seasonal visitors include Black-bellied Thorntail and Amethyst Woodstar. We will also spend plenty of time and effort birding the entrance road to the lodge, where a stunted white sand forest holds a unique avifauna including Pale-bellied Mourner, Bronzy Jacamar, Natterer’s Slaty-Antshrike, Black Manakin and Spotted Puffbird. Beyond the entrance track in the neighbouring cattle ranches, we find incredible concentrations of parrots, with six macaw species including Hyacinth. The diversity at the Rio Azul is amazing, the birding incredible, but to date none of the birders I have taken to this lodge come away talking about birds! This family-run lodge is comfortable, quiet, and the personalized attention and above all, amazing food is always fondly remembered by happy visitors. Nights at Rio Azul Jungle Lodge. We have a final morning at the Rio Azul to track down any target species we may not expect at Cristalino. After a farewell lunch we load into the lodge’s pickup to head to the banks of the Teles Pires river. Here we will be met by our local guide for the half hour transfer to Cristalino Jungle Lodge. It will be quite late in the afternoon by now, and we should see plenty of wildlife on the short trip to the lodge; birds should include the striking Capped Heron, pairs of Bat Falcons, and perhaps even Razor-billed Curassow. Night at Cristalino Jungle Lodge. There is little doubt that Cristalino Jungle Lodge is the finest birding destination in the Brazilian Amazon. With more than 20 kilometres of well-maintained trails, an uninhabited river, experienced and attentive staff, and two 50-metre canopy towers, it is nearly as an afterthought that we mention its bird list of more than 550 species. With five full days to explore the area, we’ll have time to visit the key birding sites. The showpiece canopy towers provide great views over the treetops and give us good chances of seeing coveted species such as Curl-crested Araçari, Yellow-shouldered Grosbeak, Pompadour and Spangled Cotinga along with White-bellied and Red-fan Parrot. Eye-level flyby views of Blue-and-yellow and Scarlet Macaws are common. The extensive trail system at the lodge provides the birder with access to bamboo and vine-rich terra firme forest with sought-after species like Curve-billed Scythebill and Rufous-capped Nunlet. Other trails takes us to atop a pair of granitic domes with more semi-deciduos forest and killer views of the surrounding canopy where we may find Pied and Brown-banded Puffbirds. Vast terra firme forests shelter leaftossers in their understorey haunts and are loaded with antbirds like Spot-backed, White-browed, Black-faced, Bare-eyed, and more. An active antswarm in the right place could be attended by Black-spotted Bare-eyes, Spix's Guans and perhaps even a band of the endemic Dark-winged Trumpeter. We’ll visit known leks to look for Snow-capped, Red-headed, Flame-crested and Band-tailed Manakins. The list of avian attractions goes on and on; there will be plenty to keep us busy every minute. To top of it all off, the excellent food, comfortable accommodations, icy cold caipirinhas and sinfully hot showers make it easy to unwind after a long day’s birding. Nights at Cristalino Jungle Lodge. Final morning's birding at Cristalino before our transfer to Alta Floresta. After a farewell lunch in town, you will meet your early afternoon flight for Cuiabá and onward connections. Arrival in Cuiabá is scheduled for 15:55. If necessary, there are several convenient hotels near the airport in Cuiabá, and we can arrange a reservation should you so desire. INCLUDED : Tours start and end in Alta Floresta, 11 overnights at Rio Azul Jungle Lodge and Cristalino Jungle Lodge and 01 at Floresta Amazonica Hotel, full board, outings as described, transportation, local English speaking guide. NOT INCLUDED : Air tickets to Alta Floresta and Cuiabá, beverages, medical costs or hospitalization, insurance, personal expenses as laundry, phone calls and Cristalino Forest Reserve Conservation Fee (US$85). ACCOMMODATION : The Amazon lodges used are the "Floresta Amazônica Hotel" a 4 star hotel in Alta Floresta city with private bathrooms, air-conditioning & swimming pool, and "Rio Azul Jungle Lodge" basic lodge and "Cristalino Jungle Lodge" inside pristine rainforest at Cristalino Reserve. In case your flight does not have connection on the same day to Alta Floresta, we suggest you a stay an overnight in Cuiabá, capital of the State of Mato Grosso. REGULAR ROUND TRIP TARIFF: R$ 985,00 + R$ 10,95 (Dep. Tx) = R$ 995,95 – Aprox. US$ 550 per person. The value in US$ Dollar can vary according to the exchange rate. RESERVATION : The dry season is also the highest in tourism, so book well in advance to confirm a place in a group. GROUP SIZE : Group Size is limited to 06 participants, unless special arrangements are made for private tours. Should only one space remain on a tour, our policy is to accept a couple traveling together, even at the risk of exceeding our stated tour limit.